With this kayak, you can cruise on a calm, still lake in the morning or race down the river as you see fit. The Sea Eagle SE 370 is an affordable ($339.00), light weight (32 lbs.) and heavy duty (holds three people or 650 lbs.) craft, which you can easily carry. You can also enjoy family adventures and load it up for solo excursions, such as fishing trips as per your requirement. 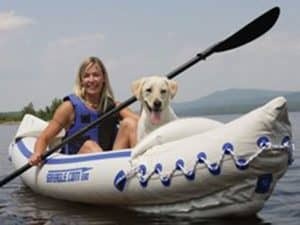 The tough PolyKrylar hull can even take the damage inflicted by your favorite pet’s paws as you enjoy a river trip with it. Its I-beam construction floor lends it extra durability and stability. There are also two skegs present on its bottom to enhance speed and tracking. When deflated, the Sea Eagle inflatable boat can easily fit into a storage bag, but when fully inflated, it can hold all your supplies including camping gear! This versatile boat can be used for a number of water based activities. It can even be taken on trips in whitewater rivers up to Class 3. The kayak also comes with a pressure gauge so you can monitor its condition while on the water, and also a repair kit so a puncture doesn’t mean a swift end to your trip. Is the Sea Eagle 370 Right For You? A drain valve that bails by itself. Inflatable spray skirts that have been lashed down. Durability: Made out of rugged PolyKrylar, this craft can easily sustain collisions with concealed rocks in the whitewater as well as the effects of being dragged along a rough shore or the paws of your pet if you take it with you on a boat trip. Stability: The 2 feet width of the vessel give it more than enough stability to allow for activities such as fishing. 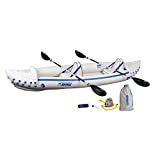 Weight carrying ability: With a load limit of 650 lbs., this lightweight boat is excellent for family excursions (3 people) as well as extended river exploration which would require you to carry plenty of gear / cargo. Tracking: Comes with two skegs, which is surprising for its price, especially since much costlier vessels have a single skeg! The two skegs allow it to track well, even in whitewater. Solid construction: Made from seams welded at a high frequency, this inflatable kayak doesn’t have the problem of protruding seams, which plagues several other inflatable vessels. The self-bailing drain valve means you won’t have to worry about water filling up the kayak while boating in whitewater. Mobility: The paltry 32 pound weight of this kayak, combined with the fact that it can fit into a storage bag while deflated, means that a single person can handle it without any problems. No inflation gauge for floor. The blue dye on the seats’ webbing can get on the PVC when the webbing is exposed to water. Built in storage is a bit small given its large load carrying capability. A low cost, heavy duty, multipurpose and reliable kayak, this is recommended for those who are interested in team based water activities. Especially noteworthy is the fact this kayak can hold its own in Class III whitewater.